TOTALLY UPDATED BEACH FRONT Condo available by day week or month from 999 A WEEK AND UP DEPENDING ON TIME OF YEAR. Located at 250 Estero Blvd "Estero Island Beach Villas" Just as you Across the bridge stay on the right then turn right on Estero blvd..down the street twards north end on left side right on the "Gulf of Mexico" This updated 4th floor condo has 2 bedrooms, 2 full baths, living room, kitchen, dining area,2 reclyners, full size washer and dryer in your condo. all in over 1000 Square feet of living space. renovated in 2014,2015. There is room enough for 6 people..master bedroom king bed/full private bathroom. guest bedroom 2 full size beds/private full bathroom. With a flat screen TV in each bedroom plus living room that also has a couch sleeper queen sofa. for a total of 3 flat screen TVs and dvds.2 reclyners and sleeper sofa in living room with flat screen tv. 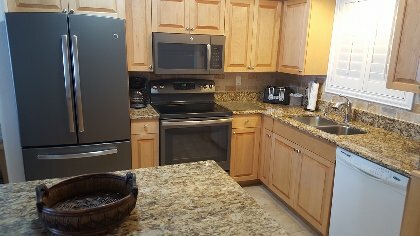 granite counter tops throughout kitchen/baths. Relax on the beach or by the private pool and kiddy sprinkler pool. You will absolutely love your stay. Across the street on the canal is a very nice bait shop were you can rent fishing poles or even a boat to go out into the gulf fishing with your family. On the gulf in front of the condo they have cabanas and water sports to rent. 250 Estero Blvd is the address just next door to the pink shell and thier resturant.one block away is the BOW DITCH POINT STATE PARK & for nice meal only 4 blocks from TIMES SQUARE.Our rates blow the competition away.and remember location!!!! Pick your days,week or month or more by viewing the availability calendar. I like to rent Saturday to Saturday if possible, or if there are open weeks I can accommodate a three night stay more or less. Enjoy the sunset from the fourth floor of this spectacular condo directly on the Gulf of Mexico out on the screened lani. TO COMPARE MY RATES IN SAME BUILDING CHECK.www....com AND YOU WILL SEE MY RATES ARE HOTTER THAN THE REST. Special rates for rentals of more than one week. Must add FL.room taxes and cleaning fee. Check my web for more pictures at www....com/322992. Any question, feel free to email jsr@frontiernet.net or call me direct at 715-853-8345 (Please mention FindVacationRentals.com Listing #9897 when you call) .If no answer please leave a message and we will get back to you ASAP. we now have 2 gas grills for your cooking outdoor plesure.we also have added FREE wireless internet right from your condo. there is a pack n play for small child and adjustable booster seat in my condo. the island beach park with water slid and large kiddy pool plus adult pool for xtra fun is just down the street behind topps grocery store.closed tue and thur its fun. also zimmers sports park is just off the island with go carts etc. WITH THE CONDO IN THE BACKGROUND YOU CAN SEE YOU ARE DIRECTLY ON THE GULF OF MEXICO. SO RENT A CHAIR AND ENJOY THE SUNSETS OR A DAY AT THE SAND. 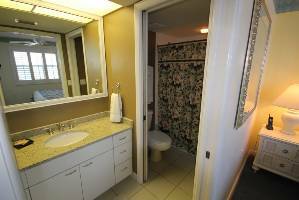 This was our best vacation ever.We reserved unit 403 and Johns wife had everything to a tee!, It was extremely clean.It has updated appliances,very spacious living area with 2 bedrooms that offer privacy. The screened in lanai was gorgeous and watching the sunsets and viewing the gulf's view was breath taking. There are many shops and resturants in walking distance to Times Square along with trolley service that is very reasonable. We will definitely return to this amazing destination!! I give this rental a full 5 star rating. It was the most wonderful, relaxing vacation that I've ever taken. I will definitely be returning. I would highly recommend staying here. It is perfect for the entire family or just for a couples retreat. From the moment we reserved condo #403, the owner John and his wife had everything taken care of for us. It was exactly like a "home away from home", except it was on the stunning Golf Coast of Estero Island! The view from this condo's (screened in) patio was breathtaking. This location has everything you need, during our stay we never had to leave the island. The Trolly is very affordable and takes you anywhere on the island. One big thing I noticed compared to other vacations that I have taken to Florida is that we didn't have to deal with any crowds. The beach is like a private beach. It's safe and quiet. There is so much to explore, we found loads of sand dollars and beautiful seashells. If you are looking for the perfect beach vacation, this is where it's at! You will not be disappointed!!! We absolutely love the beach!!! We have come down to Ft. Myers for the past 8 years and can't seem to get away. This condo perfect for family. Newly updated and works great!! Right on the beach and close enough to walk to all the happenings in the area but far enough away that it's now noisy!!! We really like coming back to this condo and plan to be back again next year!!!! We have been going to Fort Myer's Beach for the last 20 years. We alway's look for direct, unobstructed gulf view's as #1 priority and this condo deliver's! Most people want to be near the action (Times Square) but not in it as a good nights sleep (read: quiet) is priority #2 for us and the location approx. 7/10th's of a mile away was almost perfect. Our Priority #3 is good overall value as no one want's to feel ripped off. We felt that this condo delivered on value as well! We will stay again. We had never been on this side of FL so we didn't really know what to expect. I am telling you that we hit the nail on the head since we couldn't have picked a more perfect place. The location is almost to the end of the barrier island and QUIET. The view from our lanai was worth its weight in gold. Oh my gosh, the sunsets! While in the unit we spent most of our time overlooking the incredible beach with its firm sand, great waves, and beach combers. Just below our unit, were two turtles and we had fun observing them. Bowditch is just a few short steps to the north and we had a great nature walk there. Our owner suggested that a rental car was not necessary so we decided to take him up on it. Again, we hit the jackpot. Not only did we save over $700 plus parking fees but we could ride the public transportation for a mere quarter per person! If we didn't feel like taking the trolley to Times Square, we could walk the beach in approximately 20 minutes to the many shops and restaurants. By the way, on checkout day, we had lots of time before our flight so we decided to take public transportation back to the airport for a grand total of $1.85! The condo was everything you would hope it to be. CLEAN AS A WHISTLE! TIDY! VERY COMFORTABLE! AIRY! Well stocked with everything you need to conduct a household. We had the opportunity to meet the owner's wife and had a great conversation. If you are looking for a great get away, you can't go wrong with this unit! WE RECOMMEND IT! 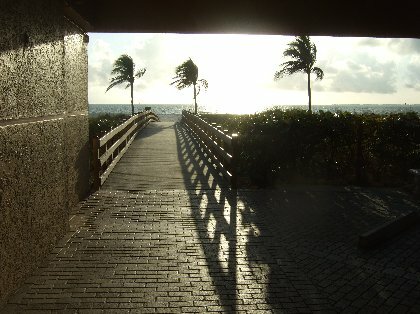 I stayed at the Beach Villas for my first visit to Fort Meyers Beach, loved it. The location is great, at the North end of the beach. Quiet location but close to the night life at Time Square. The condo we stayed at was great, better than the photos showed, it had everything we needed for our stay. We had a beautiful view of the ocean and a short walk to the beach. I would definitely stay here again and go back to Fort Meyers Beach. I found this property to be perfect for a week's stay. Close to many activities, pubs, restaurants and shops. Boat rentals a short walk away, and other water activities. Condo was clean and self sufficient. great views. Walk-out to the gulf. Very nice. This condo is great! Lots of updates, clean, well stocked. The building maintenance people were also great! The disposal temporarily stopped working when we were there and a maintenance guy was there in less than an hour to fix it. The lanai is wonderful and we ate every meal looking at the ocean. Overall, a great unit and we will definitely look at staying here again if we return to Ft. Myers! Loved this unit!!! So convenient! Trolley met right next door, close to everything and the unit was lovely! Master suite was awesome, luxurious bedding and I slept with the lanai door open and fell asleep listening to the waves wash on the shore. Everything we needed was there. I highly recommend a stay in Mr Rusch's unit and we plan on returning again and again!!!!! We had our stay in this beautiful condo from May 11-18th. It was by far the best trip. The location of this condo is prime. It over looks the softest most beautiful white sandy beach. The Condo was clean and well stocked with dishes, pots, pans, silverware and coffee pot and was well stocked with plenty of linens. There is a washer and dryer in the unit which was wonderful. It was literally a home away from home. It never felt like we were in a stuffy hotel. There is also a screened in patio so we got to enjoy the lovely sounds of crashing waves without the bothersome bugs. Thank you John and Sue for sharing your little piece of paradise with the rest of us!!! WE WILL BE BACK!!!! We rented this condo in March. What initially attracted me to this unit was the location. It was far enough away from all of the activity in Times Square making it nice and quiet and it was only a 10 minute walk to Times Square. This condo is very well furnished (including all towels, linens, cooking utensils, etc.) with a screened in porch overlooking the oceanÃ¢â‚¬â€a nice place to sit and enjoy my morning coffee. I would definitely recommend this unit. We had a wonderful holiday celebration at the condo. This is our second time to stay at John's condo. We really enjoy the location and being able to walk toTimes Square and Bowditch Park. The lanai provides a fantastic place to enjoy a glass of wine and watch the sunset. The condo is very well equipped. We are looking forward to our next stay. We stayed at John's condo the last week of October and thoroughly enjoyed every minute of our vacation. The condo was very clean and extremely comfortable (especially the king size bed). It had everything you could wish for and more. The view from the lanai was stunning, it was lovely to sit and watch the sun setting over Sanibel Island. We were sad to say 'goodbye' but will most definitely be back. Our stay was at the beginning of September. The Beach was very private and nice. We were so close to restaurants and shopping. The Condo itself was extremely comfortable from the Recliners, sofa to the mattress on the bed. We have rented condos before, none were so comfortable.The view of the gulf was truly unbelievable. We will be going back again next September. Highly recommend this Condo. The owner and the Realty Agents were very nice. I highly recommend John’s condo to anyone looking for a place to stay on the Gulf. The view of the gulf is beautiful from the screened in Lani. The condo is updated and very clean. The condo is laid out very nicely. The Beach Villas property is very clean and well maintained. Great place to stay!! We live in Ft.Myers but wanted to stay on the beach for the 4th of July. Condo was perfect. We were away from the busy spots but close enough to walk and join in. The condo was fully equipped, clean and just ehat we wanted . Hope to stay again in the future. We would highly recommend staying here! Had a great time, we were here May 2012, the accommodations were great, even had beach chairs, umbrella, floats and beach toys for the kids there. Everything you could need or want! The beach is excellent and private, wonderful sunsets! Location, location, location! What a wonderful stay we had in John's condo. I have rented condo's and homes many times for my family and this was our favorite. This is what I look for when I am searching, a condo where I can actually see the gulf from my unit. My wife and I loved sitting on the lanai and enjoying the view, especially the sunsets. 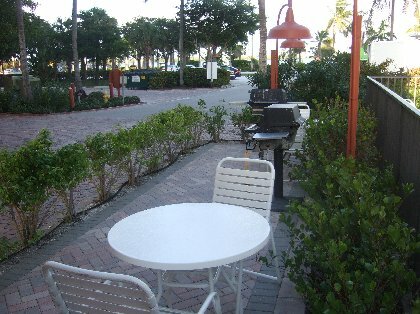 We enjoyed the beautiful beach and the close proximity to restaurants and shopping. My daughter and her friend loved taking the trolley. John and the realty company were easy to work with and John was was fantastic (and quick to respond). We hope to come back next year! Stayed at the end of October. We are going to rent this place again in 2012. We have gone to FMB for 4 years and rented elsewhere. This is by far the nicest condo we have stayed in. The location is the best, the condo was clean and updated. You can also use the resort and pool next door, really fun. Looking forward to this fall! Like everybody said--Place is great-comfy living room with flat screen TV(boys like thrie sports). I love the bedroom that has windows opening to the view and sound of the waves from your BED!!! Just read a book in the bed and look out at the ocean and hear the waves. If you stay closer to town-beach gets very crowded and where we are-not crowded and easy walk to town. We rented bikes and rode 6 miles right on the beach next to the water and 6 miles back--great workout! !John is very nice to work with and if you do have aproblem-make a phone call and maintence will take care of it right away. Can't go wrong with this place. Oh Yea-you can walk next door and eat outside at Pink Shell-they have great food-especially their Sweet potato Fries!! You can read the other reviews about the condo, so I won't repeat all of that. Yes, it is very nice. Couple other things... the layout is great for two couples as the bedrooms/bathrooms are separated for privacy. The second bedroom is very roomy and a nice big window. Closets are big. Lots of plush towels including a couple of beach towels. Bed linens are high quality and master mattress was so comfy. Just hubby & I this trip so can't speak for the other beds, but based on everything else in the condo... I'm pretty sure they are comfy too. Stackable washer and dryer are top notch. Awesome for flying home with clean clothes! =) The under building parking is also very nice. The spots are a first come basis. The bulding and grounds are well maintained. Nothing is run down. The permanent residents were very friendly. The rental company was easy to work with. Picking up the key and dropping it off at the rental agency just 1.5 miles down the road was simple. They even have after hours options. The location is our favorite on the north end. Quiet beach, yet less than a mile from Times Square and the best restaurants in our opinion. This end also has the new streets with beautiful landscaped sidewalks and bikepaths on both sides... perfect if you rent beach bikes! Highly recommend "Quickie Rentals". The expanded beach is also amazing now. The owner John is prompt to reply to emails and great to work with. We loved it here and will look into this condo first when we come back to FMB. We, my husband, my son and I, had a great vacation at this beautiful condo. Everything you could possibly need is right there, ready to use. Wonderful flat screen tv sets and a beautifull washer/dryer combination! The condo is clean (very important) on the inside and outside (the pool, elevator) also. It was our first time at Fort Myers Beach, but certainly not the last time. My family and I just returned from a week in John's condo and I cannot recommend John or his condo enough. From the very beginning John and the realty company answered all my questions and were very helpful. The condo is in a great location, was very quiet and relaxing. I will use this condo again on my next family trip to Ft. Myers. we took our first vacation to ft myers beach this past july and stayed at johns condo. we cant say enough about it. location to everything was great!! the rental company was very easy to work with. thanks. when we go back we will be contacting john. We had a wonderful time in this unit. The view from the lanai is beautiful. It was nice walk to Times Square along a white sandy beach. The bed was very comfortable as were the recliners in the living room. The kitchen was well stocked with items you might need for your vacation. Beach chairs and an umbrella were welcomed additions too. This was our 1st stay on the north end of the island , but it won't be our last ! 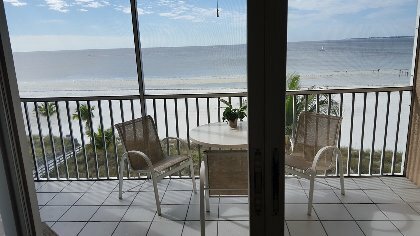 This was our first visit to Fort Meyer's Beach and the two things that made it most memorable were, the beautiful view of the Gulf of Mexico and our stay at the Beach Villa Condos. There is not one thing I can think of that could have been added to make our stay more comfortable. John and Sue put a lot of thought into making this feel like home away from home and that's exactly what it was. We have already started planning for next years vacation and we wouldn't consider staying anywhere else. This was our family's first trip to Ft. Myer's Beach. It was a great time! We rented John's condo and the condo right next door. John's condo was perfect. The place was very clean and had everything we needed for our stay. It is a short walk to shopping, dining, fishing and boating. We stayed a week and didn't want to leave. Great place. I have stayed at many rentals through the years and this rental is excellent. The kitchen was the best equiped kitchen. We saw Dolphins from the balcony every morning. Thanks for a great time. We loved John's place!!! This was our first visit to Fort Myers and we couldn't have been happier with the condo. The view was absolutely gorgeous! The unit was well equipped with everything we needed. We had breakfast and lunch in every day and we had plenty of space to cook and eat for our family of 5. Thank you John for the wonderful place...we can't wait to come back! Once again I can not say enough about our stay at John & Sue's Condo on Ft Myers beach! This is our second year for staying there and it won't be our last. Everything you could need is right here. Thought we would have to cancel because my husband ended up having to have open heart surgery just 3 weeks before we were to check in, but with God help it was a wonderful relaxing place for him to recover!! The kids love that we are right on the beach, but also that the pool is there to enjoy also, cooking out on the grill and a view to die for. The dolphins were with in 50 feet of us swimming in the ocean! And John you were right the two extra days we were able to book made out trip even better!! I would tell anyone looking for an affordable, comfortable, well stocked home away from home, this is the place you want to be! Thank you again for everything and we can't wait to go back again next year!! June 14, 2011 Reviewer: Lynda Mock From: Litchfield Park, AZ. This particular property is wonderful and so well equipped. We like to eat out for lunch most days and dinner is in, so for someone who likes to cook, the kitchen is perfect! Most timeshares have uncomfortable furniture and beds, so renting a privately owned condo furnished by the owner was a great surprise. Furniture was very comfortable and beds are great. Can we talk about the view and the beach, wow, we will be going back. We had a fantastic time at John's condo. Great location, great ocean views, great everything, no OIL!! The worst thing about this vacation was we had to leave Ft. Myers Beach!! John was very helpful and we would go back!!! What can I say!! This was the most amazing vacation ever!! We feel so lucky to have had the chance to stay John's Ft Myer Beach condo! There wasn't anything that we needed that wasn't there, fully stocked kitchen, (pots, pans, dishes, glassware, storage containers) dish washer, plenty of towels, bedding, washer and dryer, wireless internet, (that the 3 kid's couldn't have lived without!) lawn chairs, sand toys I could keep going on and on. Our family has gone to Ft Myers Beach for the past 10 years and this was by far the best time we have ever had. The view was out of this world and it was so nice to be able to go down the elevator and right out onto the beach. I would tell anyone that they would be lucky to stay at John's condo, and I hope that this is just the first of many trips that our family will be staying there!! John's condo was everything he had promised. Clean, well stocked with towels and linens and a beautiful view of the Gulf. It slept 6 of us comfortably in beds and the full-size kitchen served our family well. This north end of the island seems to be the place to be.. a bit more quiet but close enough to the Pier to walk. I was also pleasently surprised at how quickly John would respond to my e-mailed questions prior to my trip. 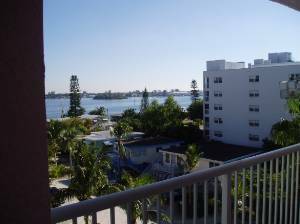 Fort Myers Beach is an amazing vacation spot and this condo is in a very convenient location. It is within walking distance of stores, bars and restaurants. The trolley also runs all day for 50 cents a ride and goes all the way up the island to the nearest grocery store. The condo itself is fully stocked and all 6 of us slept comfortably. The beach is right there and there is also a swimming pool. I would definitely recommend this condo because it is a great value for everything you're getting. This was our 3rd visit to Ft Myers, we stayed at the Pink Shell last year and this condo is right next door. We were able to rent the umbrella's and chairs from the Pink Shell which was so convenient! The staff at the Pink Shell is excellent and there is a very good outside bar and restaurant for lunch. The condo itself is nicely decorated, clean and well equiped kitchen if you want to eat in. Be sure you take a walk further north and visit the park. The best is the beautiful view of the gulf - Beach front! and the gorgeous sunsets. An easy walk to the hot spots of times square or you can take a trolly that runs every 15 minutes or so. We had a great time! Thanks John & Sue. We will be Back!! I have stayed many times at the Pink Shell on business (next door) as well as other properties on Ft. Myers Beach. This location at the north end of the island is by far my favorite part of the beach - close enough to shops and restaurants to be within walking distance, far enough away to be quiet. The condo was clean, just as described, and right on the beach. Everything you need for a great vacation. Outside of the building looked like it was just painted and they were updating the pool area to include a hot tub when I visited in October 09. Given the opportunity, I would go back. Had a great time. Great location on the quiet side of the island. Beautiful beach, amazing views. We felt very at home here and it sure beat staying in a hotel room. Chairs and beach umbrella made going to the beach a breeze and the kitchen was well-equipped and very spacious. The whole experience was lovely! We just returned home from a wonderful family vacation and wanted to share how pleased we were with our accomodations. We felt very much welcomed and at home as soon as we opened the door. One of our favorite features was the large, screen enclosed, porch that directly overlooked the Gulf of Mexico. What a great way to relax and recharge your batteries. Thanks for a great week....we'll be back!!! We enjoyed our stay in this unit. It is well stocked with towels, bed linens, and plenty of kitchen utensils etc. The condo is large enough for families, and has all that you will need to make a great vacation... Thanks! First let me say that I have stayed at many condo's up and down the coast of Florida. From Panama City to Key West. I have spent from a few hundred dollars to several thousand dollars for a weeks stay, depending on time of year. 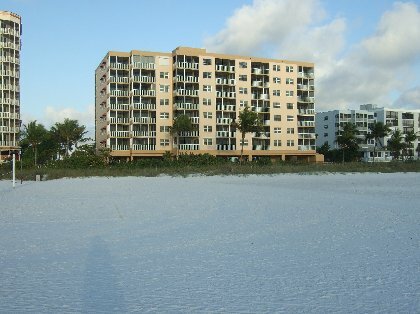 If you are familiar with Fort Myers Beach and the Pink Shell, then you know where this condo is located. It is right next door to the Pink Shell. It is a 7 story complex with 2 elevators. There is some underground parking but there is plenty of parking, while I was there anyway. We took the elevator to the 4th floor and were very pleased to see that our unit was just across the hall. Walked in the door the kitchen was on the right, with an island. The kitchen had everything we could have needed; a frige, microwave, dishwasher, coffee maker, silverware, pots and pans, etc. Other than making sweet tea (which is hard to come by in Ft. Myers) I had no use for the kitchen, as I had no plans to cook anything. The living room and sliding glass door which lead to a screened porch with a table 4 chairs and a lounge chair and ceiling fan was just past the kitchen. The first left is the guest bedroom, 2nd bath and apt sized washer and dryer. Closest to the beach was the master with it's own bathroom. There was nothing wrong with this unit. It was comfortable, easy in and out and about 1 mile from all the shops and such. A nice walk, even for those of us not so physically fit. The owner of this condo is very accomodating. He answered any questions I had about the area and where to go and even having to leave early because my son got a call he had to leave for Marine bootcamp in a couple of days. If I get back to Ft. Myers, which I will because I love the beach and the lesser traffic from places like Panama City and Key West, I will absolutely stay here again. This condo is well decorated and comfortable. Although we did not spend much time in the condo as we were snorkeling, during the rain driving to Ft. Lauderdale and Miami. This is a great vacation spot for anyone looking to be RIGHT on the BEACH, with beautiful views, a nice owner who can answer any question and a mostly quiet location. well maintained and exceptionally clean. We have the condo reserved for Jan 10 and hope to make this an annual event. We highly recommend this condo. We stayed in Johns condo at Ft Myers beach the week after Christmas and it was awesome. It is very roomy clean and very comfortable. The weather and the beach were great. We usually go to Destin or Ft Walton beach because the drive is shorter, but this condo and beach were well worth the 18 hour drive!!! I would highly recommend this condo to everyone!! We stayed in this condo from 11/23/08 - 11/28/08. It is a great condo for the price. The beach is very nice and far enough away from the public beach that you don't get all the crowds but still close enough to walk to the square. There is a great view of the ocean and the condo has been kept up very well. The owner and rental agency are both very easy to work with. I would stay here again and would recommend it. This was the ultimate beach condo. We stayed in John's condo from November 8th to the 15th. The condo is right on the ocean. We were pleased that the walk to the water was so short and you could be on the beach swimming or relaxing in a matter of minutes. The condo was well supplied and I was happy to discover that I didn't have to run to the store first thing to buy things like dish washing detergent, toliet paper, etc.. We would definitely rent from John again, it was a pleasent experience. A beautiful property that was very enjoyable. We are a family of 4 and had a great time. The condo is in great shape. The kitchen was well stocked; we were pleasantly surprise that there were some beach and pool toys available for our children. Everything was very close, for example, we would walk to the pier with our 4 & 8 year old children. The quality was comparable to a newer timeshare (without the pesky presentation). Additionally, John was excellent at communications. Most e-mails were answered in less than 24 hours. We stayed in your condo the week of 09/07 - 09/14 and we really enjoyed it. There was plenty of room for us and plenty to do. The beach was great, and you could walk to the pier or times square within minutes. We recommend the Burrito GoGo place and the Yachatan (we ate at both places twice). 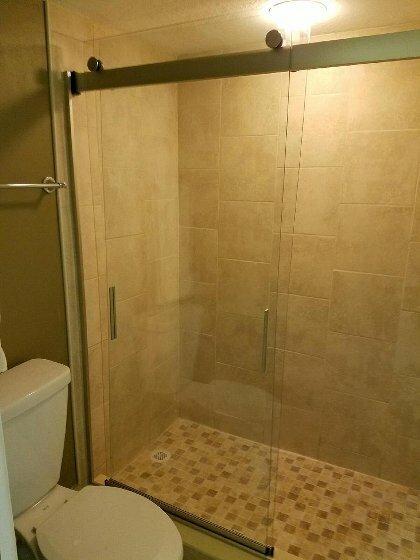 Definitely would recommend this condo to anyone. 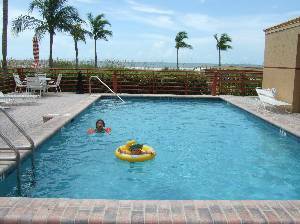 We visited Fort Myers Beach for the first time the week of September 7th and stayed at the Beach Villas #403. The condo was nice and clean. It had everything in the kitchen that we could need or want. The price was very reasonable and I'm sure that we will go back again. 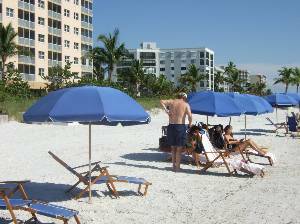 We live in Cape Coral and like to stay at Ft Myers Beach once or twice a year. The condo, location and views were great. The condo has a beautiful view, clean, and has easy access to the beach. The owner is willing to work with the renter. We found John very helpful and our EBAY experience was 100% truthful. We'd do it again. Excellent experience. Unit was clean, well equipped and location was superb. Will definitely want to use it again. July 2008. What a View! We really enjoyed our stay in your condo. There was plenty of room for us and plenty to do. The beach was nice, you could walk one way to a park or the other way to times square. I recommend the burrito place, well worth it. They even have a movie theater that offers a menu (a little pricey, south end of island). We also had fun renting a boat from across the street. Thanks for a good deal! We absolutely enjoyed our vacation. The condo was in a perfect location right on the beach. We were away from the really busy part, but within distance to go anywhere. We really enjoyed the balcony looking out to the beach. The kitchen was perfectly stocked. We felt at home for the week. I recommend this condo to anyone. We had a family of five in this condo, and it was perfect! We stayed for a week in a very nice condo (Beach Villas #304, first week of May 2008)with direct access to the beautifull beach of Fort Myers. The condo was just what we needed,a nice living, 2 big bedrooms, 2 bathrooms, a big kitchen including all you could wish for. The condo is located on the nothern part of the island. We think this is one of the best locations on the Island. 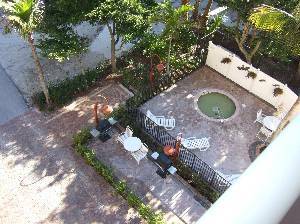 Walking distance to the fishing Pier and restaurants. In the sea in front of the condo we saw daily Dolphins hunting for fish and at low tide we saw many Startfish and Sanddollar ( go right on the beach). Thanks for staying in your beautifull condo John. The condo was great. After several days with my kids at Disney World, relaxing on the beach was just what the doctor ordered for my wife and myself (and the kids too!). The property was great, conveniently located, spacious parking and in a place up the beach a bit from the pier so not crowded. The views from the balcony were spectacular: great sunsets and seeing dolphins swimming in the surf as we were eating breakfast. The condo is very functional with all of the amenities working fine. The condo pool was small private and never crowded and heated to a very comfortable temperature that allowed swimming in the evenings after the sun had set. Finally, the white sandy beaches with ample shells for collecting were great fun for the kids. I would highly recommend this condo. Beautiful Condo RIGHT on the beach. Perfect location to relax and have some fun. We walked right out to the beach from our condo for walks/runs every morning, extremely easy access for our car, never a problem parking or waiting for an elevator. Perfect walking distance to Time Square where you can shop and eat. People of all ages were vacationing. Our Condo was Clean and organized with everything we needed including beach chairs. Everyone was happy with their own T.V. in each room (March Madness). A real find for a terrific Spring Break. John, the owner, could not have been more accomodating in getting back to us, following up with any answers to questions we might have had. Great place! One bedroom has two full-sized beds, the other a king. Couch isn't hide-a-bed. When we left, chairs were in the closet for the beach. Walking distance to Times Square, where you'll find shops, bars and dining (ice cream, too!). Warm pool. Family-oriented and safe. You can get ready to go down town and see the Gulf reflecting in the bathroom mirror..... Loved it. Thx John. What a wonderful vacation! This was everything we had hoped for. Excellent location - very nice beach - finding a quiet spot to relax was never a problem. Just a short stroll down the beach & you can join the fun at the bars & restraunts. We really enjoyed the layout of the condo. The lanai off the master bedroom is fantastic! Listening to the soothing sounds of the ocean as you fall asleep, waking up to the ambiance of the beach, it's the stuff dreams are made of! The condo has all the comforts of home. We hope we can come back - soon!! The condo was absolutely perfect. We loved the view and the closeness to the shopping and restaurants. Thank you! What a lovely place! I couldn't have asked for a better place to stay on the beach. It was exactly what we had hoped it would be. Wonderful location, fantastic accomodations. I have absolutely no complaints on this property. Beautiful furnishings, clean, close (but not to close) to everything. I highly recommend this property. Our stay here was amazing. The weather has been great.....and the condo is beautiful and perfect. The view from the lanai is wonderful as we watch the dolphins and pelicans...and of course...people of all different shapes and sizes....you can also see the many boats go in and out of the harbor. Cancellations and Refunds: Cancellation fee of three nights stay or longer. if cancel within 90 days no refund . without ins.